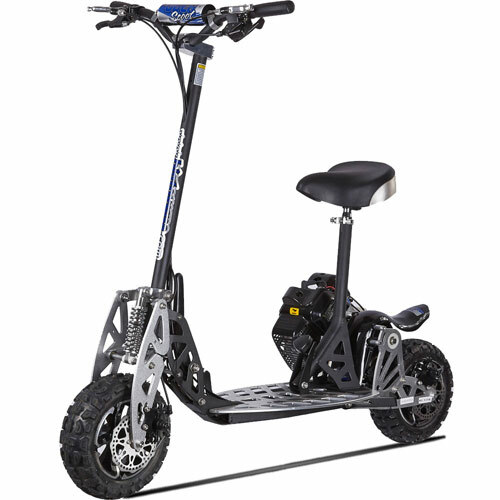 UberScoot 2X, at our everyday low price of $679. brings a whole new level of excitement to the sport gas scooter market. 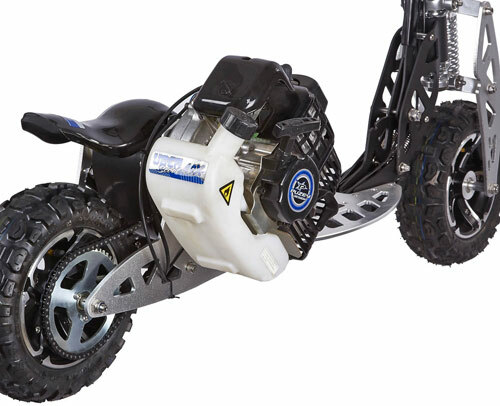 50cc 2 stroke power plant coupled to a real 2 speed transmission, wrap it up in an extremely lightweight, 53 pound platform using only superior components and what you get is a very fast scooter! 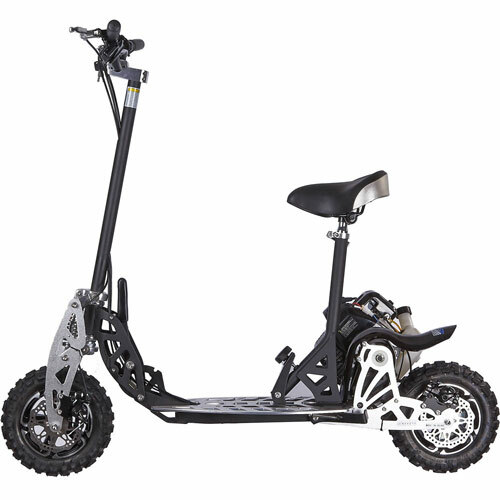 UberScoot 2X has been developed and refined to be as tough as it is functional, making it one of the most versatile folding sport gas scooters on the market. Whether used for daily commuting or extreme riding, the 2X will handle more sever terrain with ease. Built by EVO Power Boards the 2X is the original 2 speed gas scooter. 2X comes standard with the superior engineering the EVO name is famous for. Full Size. Can accommodate 6 foot plus riders with ease. Tight, hands on quality control throughout the manufacturing process. Built for everyday use. Cleanest looks in the industry. UberScoot 2X gas scooter is not only handsome, it's an incredibly dependable and functional machine. Powerful. Solid. Extremely well balanced. Excellent attention to detail. Each 2X comes with a quick release seat unit. Entire seat and it's support system remove or installs in seconds Seat is spring loaded, wider, more comfortable and fully adjustable. Quick access safety "kill switch" located on handlebars. If you are looking for a serious performance sport gas scooter the UberScoot 2X is your best choice. UberScoot 2X is designed for mid teen and adult riders. UberScoot 2X gas scooter delivers awesome power with it's 50cc 2 cycle engine. Uses regular unleaded gas mixed with a small amount of 2 cycle oil. The 2X gets around 80 mpg. Solid state ignition makes starting the 2X even easier. Improves high rpm stability and is very reliable. The 2X's clutch is fully automatic (centrifugal). Just twist the throttle and go. Transmission: 2 Speed (Thumb shifter). Final Drive: Chain. New innovative One-Touch Chain Tensioning. Tighten the final drive chain in one simple and easy action without having to align the rear wheel. Fastest folding sport gas scooter on the market. 2-Speeds. The first two speed folding, sport gas scooter in the world! 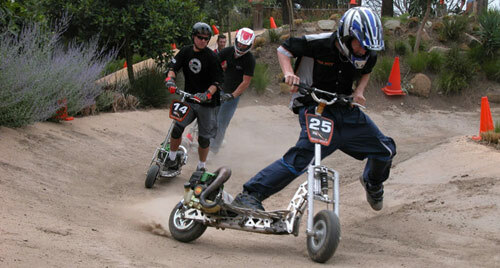 This Patented, Puzey Designs transmission gives the UberScoot 2X more power at lower speeds and faster top speeds. 2 speed drive system has been designed to make shifting smooth without the use of a clutch. Operator can easily shift drive range at any time to enhance performance as needed. Strong one piece aircraft grade aluminum deck retains it's luster for years. Tires are 11 inch tall with an aggressive Knobby tread design for better "grip" on dirt, grass or softer surfaces. 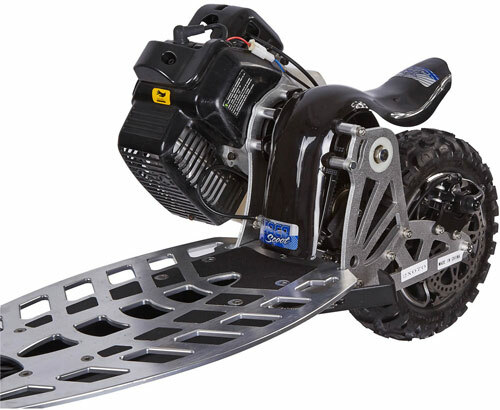 Great traction on paved or hard surfaces. These tires absorb shock and hazards better. Rear transmission cover and mud guard is standard. Easy fold and lock system makes storage and transport of your UberScoot 2X a snap. When locked in the folded position the steering down tube acts as a convenient handle. Your new UberScoot 2X arrives at your door 99% assembled! Fuel. Regular unleaded mixed with 2 cycle oil. Clutch. Automatic. Twist the throttle and go. Warranty: 60 Days, Parts Replacement. 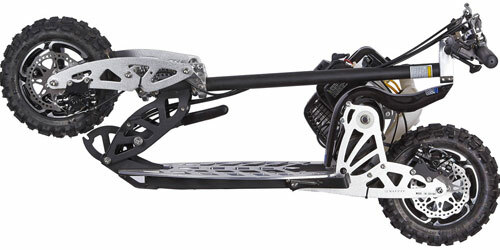 *speed, climbing ability and range depend on rider's weight, tire pressure and terrain. Please Note! Air cleaner size and shape may vary. Click the button below to add the UberScoot 2X Two Speed Gas Scooter (formally EVO) to your wish list.